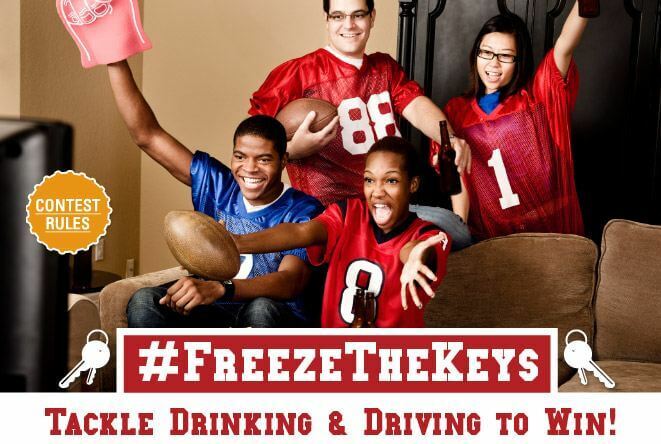 Super Bowl Sunday is quickly approaching, and this fans get ready to watch the Seattle Seahawks vs. Denver Broncos during Super Bowl XLVIII the Beer Store has launched #FreezeTheKeys, as their latest campaign to encourage sober driving and responsible party hosting. The Beer Store, the OPP, Toronto Police and arrive alive DRIVE SOBER are encouraging football fans to share tips on responsible party hosting. The campaign was kicked off at The Beer Store’s newest store in Toronto’s Leaside neighbourhood. People participating in the #FreezeTheKeys campaign are eligible to win a Sony home theatre package, including a 50″ television. Drinking and driving accounts for roughly one quarter of all deaths on provincial roads and authorities warn that R.I.D.E. programs will be in full force. The Beer Store said the campaign is another step in its ongoing effort to educate Ontario drivers on the dangers of drinking and driving. Anne Leonard, executive director of arrive alive DRIVE SOBER®, says that while public education is working, the message needs to be re-enforced, especially during major events, like the Super Bowl.